Edit: Took a A-180 Multiples and filled it with grey to create a 4 HP blank. Cut it to half to make 2 HP blank and uploaded both with the addtion 'corrected'. Thanks for the heads up. They've been added to the library. That A-124-4 is tempting. Would be a great companion to LPGs. Sorry all, I made a module for the Synthwerks MG-1 with a bogus image. The one with the suffix "(fixed)" should be good. I made an Uncle-Osc also. If I can find my images of the Wiard 300 I'll populate that set also. Word of warning: I tried to make a VC-303 zip for the 2 or 3 of us who got one. The available images are skewed, and when I cropped it, Module Maker spat out a 16HP module when I'm pretty sure it's 18HP in real life. So use it or don't but put in 2HP of spacer just in case you're going for that perfect row and you use that image. Plord, the number of HP is determined by the ratio of height to width in the image. Euro has tiny width increments compared to other formats so it's very sensitive to errors in the image. The 4ms_E_RCDBreakout.zip is faulty: The module.xml has 0 HP defined. When I change that to 4 HP it works. Then whoever entered those in the ModuleMaker chose the wrong format. I just don't have time to check everything. Can't deal with it right now. Sorry. No problem! I figured that's likely what happened. Should I upload to the correct section, and then request a deletion here or something? Hi I just noticed the horrible jpg for Plan B_E_MW Euro.zip. Perhaps this module can be replaced by a copy of this much better version also in the library: Blacet_E_Miniwave-Euro.zip. A simple suggestion: please make the modules in the queue available for download too. I often wish the list consisted of live links. People do sometimes put stuff in there that's obviously one-off DIY stuff and they probably don't mean for it to be public. Don't know whether this is the correct place to post this, but the Makenoise DPO in the library is 27hp instead of 28hp. But of course I might be mistaken and Tony decided to make it 27hp. ModuleMaker guesses how many units wide a module is by looking at the aspect ratio of the image. This is a piece of cake with most formats but euro has such tiny increments that if the picture was shot from an angle or badly cropped it can easily be off by one HP. I've edited the XML file in there setting it to 28HP. This is as good a time as ever to say thanks to you (and dougcl, if memory serves) for all you do. This is a really great resource for the community. October 30th Ã¢â‚¬â€ We have updated our software and cleaned up some data. The provisions for handling identifiers are in place. Every module has a Squiggletronics identifier now. New modules created in Module Maker and offered to the library have one too. This all becomes more meaningful when I get the API setup and that's my next programming task. There were some bugs with the recently implemented timestamps but that should all be fine now. ModuleMaker is now better integrated with the new (July 2012) library system. I did some tidying up of the data too. Euro is so diverse that it's hard to impose a consistent naming convention but I fixed some obvious spelling mistakes, near duplicates, etc. The Modcan modules all have consistent naming. This will either please you or inconvenience you but I think it's for the best. All the zips, both individual and collections, have been regenerated. There will be some new formats soon. Richy has contributed Roland 100 zips and little tiles from PulpLogic. The Mattson Mini is in the schema definition now so I'll add that too. Server was out of service for a while this morning. Sorry. Should be fine now. Added some Buchla and a Tip Top module. 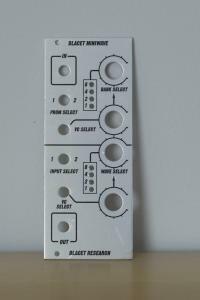 Anyone know how to open an eardrill module in rack planner (buchla rack) so that its not stretched? A limitation of RackPlanner is that it only does one format at a time. The Eardrill modules fit in a ModuleModule "rack", not a Buchla rack. You could fill a ModuleModule rack in RackPlanner, take a screen shot of it and upload that to ModuleMaker as an image for a Buchla format module. Then use that in in your Buchla rack. It's a PITA if you change it alot but it works. Just figured that out--a long process but it worked! The server hardware hosting the RackPlanner Module Library was replaced yesterday and the site was down last night but it's back in business now. I also got caught up on the backlog of incoming modules from ModuleMaker. Around about 2013 these projects were downgraded to Benign Neglect service level due to a perceived lack of interest. They are still there and still free though. This sub-forum is the place for comments and questions.